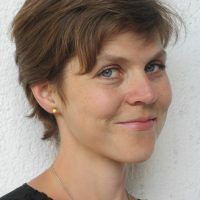 Nadia Bozak is the author of the novels Orphan Love (2007) and El Niño (2014), the first two parts of her Border Trilogy, published by House of Anansi. Thirteen Shells, a collection of linked short stories will be published by Anansi in 2016. Selections of these stories have appeared or are forthcoming in Walrus, Joyland, and Prairie Fire. Nadia holds a Phd in Comparative Literature from the University of Toronto. Her doctoral work concentrated on the relationship between the technology and industry of cinema and the biophysical world, resulting in her book The Cinematic Footprint: Lights, Camera, Natural Resources published by Rutgers University Press (2012). Since 2012 Nadia has taught the introductory “Fiction Workshop” within the Department of English at Carleton. She has also taught courses in literary theory and academic writing at Ontario College of Art and Design University in Toronto, documentary film at Laurier University in Brantford, Ontario, and literary studies at the University of Toronto. Nadia recently received a term appointment as Assistant Professor of English at Carleton where she is leading the growth of the Creative Writing Concentration. She teaches workshops in fiction (introductory and intermediate), poetry (introductory), and a special topics workshop in hybrid literary forms. Nadia is currently writing a collection of poems as well as the third part of her Border Trilogy: a timely retelling of Joseph Conrad’s Heart of Darkness which examines the underbelly of the ESL teaching industry and the globalization of the English language.